The largest collection of ethnographic primary sources supporting students’ firsthand engagement with human diversity around the world. 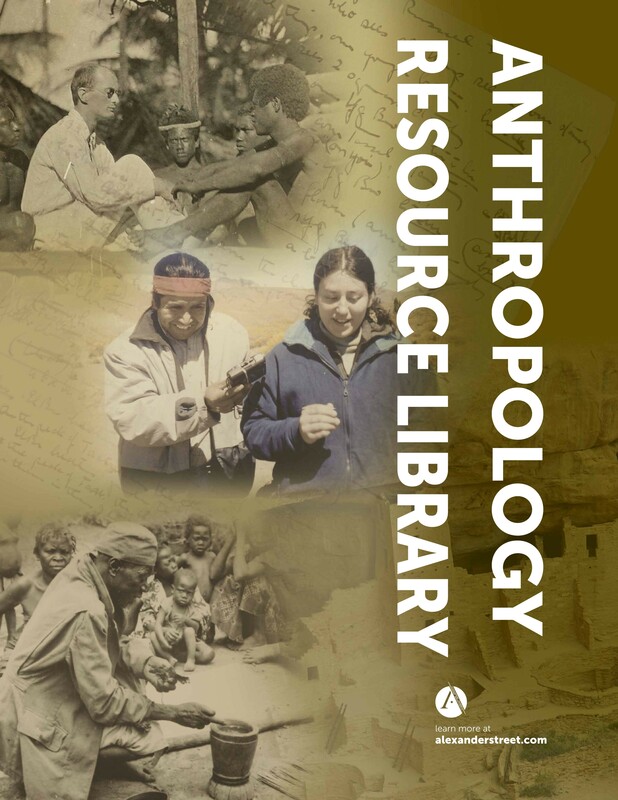 The Anthropology Resource Library contains field notes, draft manuscripts and published ethnographies from key scholars, enabling students to trace the full scholarly process in all of its iterations, from data gathered in the field to later analyses, drafts and publications. Alexander Street has partnered with archives and holding institutions around the world to bring the fieldwork underpinning the great ethnographies of the early 20th century into the digital world, available in the cross-searchable collection Anthropological Fieldwork Online. Learn more. 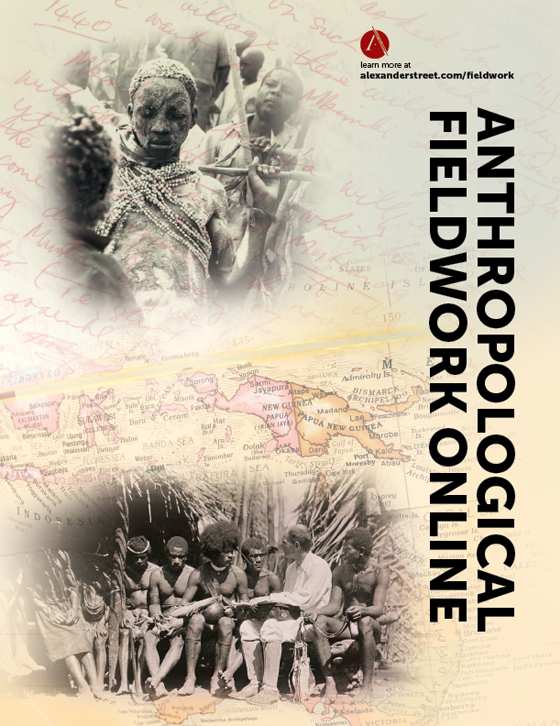 Anthropology Online brings together a wide range of written ethnographies, seminal texts and contemporary studies, many of which are the final published works resulting from the research digitized in Anthropological Fieldwork Online. Learn more. Alexander Street is the most comprehensive resource for visual anthropology in the world, providing access to over 2,000 hours of film and always growing, from raw field footage to crafted ethnographies and documentaries. 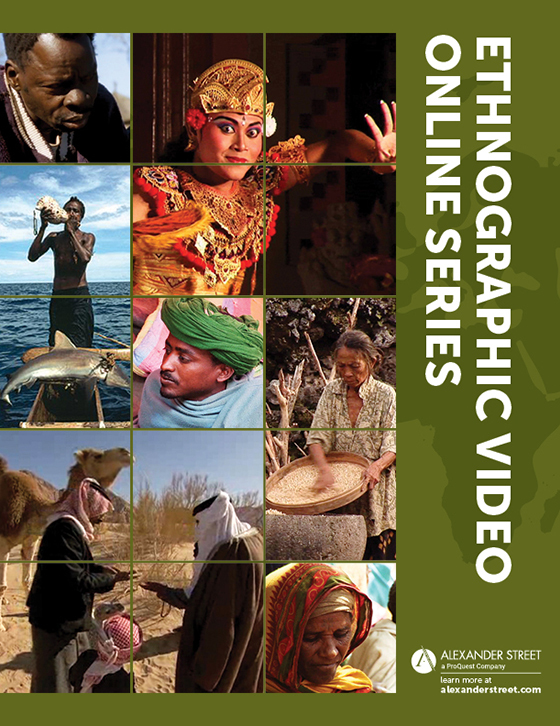 Available in any current model popular today for acquiring video, from single titles, to PDA, to curated collections, these offerings provide core visual materials for anthropology courses of all levels. Learn more. 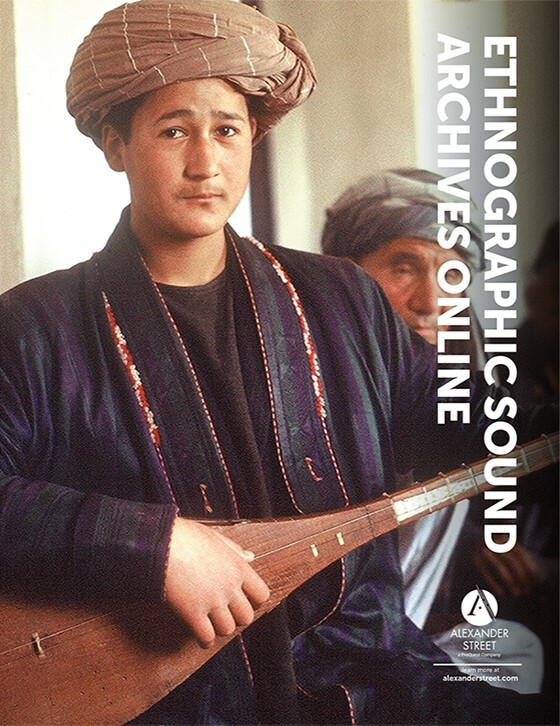 Ethnographic Sound Archives Online brings together previously unpublished historic audio recordings and their supporting field materials, opening new paths for the study of music in its cultural context. The collection brings together 2,000 hours of audio recordings from field expeditions around the world, particularly from the 1960s through the 1980s—the dawn of ethnomusicology as a codified discipline. Learn more. Alexander Street brings unique functionality to this material. Deep indexing lets users search and browse by cultural group, place, subject, and ethnographer, optimizing visibility for all material. Users can also search video transcripts to locate specific cultural groups, rituals, traditions, or case studies and watch relevant material within seconds, or pour through thousands of pages of archival content to learn how anthropology’s biggest names did their work. For example, users can read Bronislaw Malinowski’s original field notebooks alongside his published ethnographies, and find follow-up studies and visual ethnographies from his Trobriand Islands field site created a century later. How do these resources work together to support teaching and research?